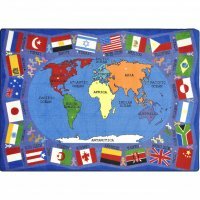 The Flags of the World Carpet helps children learn about our world. They'll be able to locate the seven continents and major oceans represented on this stunning carpet with a global view of the world map. Flags represent countries from each continent, and students can find the country by matching the colored dots. This carpet is an amazing rug for children of any nationality because it makes it easy to learn about our neighboring countries.